Are there any flaws to this product? It says so right in the product name! Now with BOOKLETS, some even have DIAMONDS!!!! 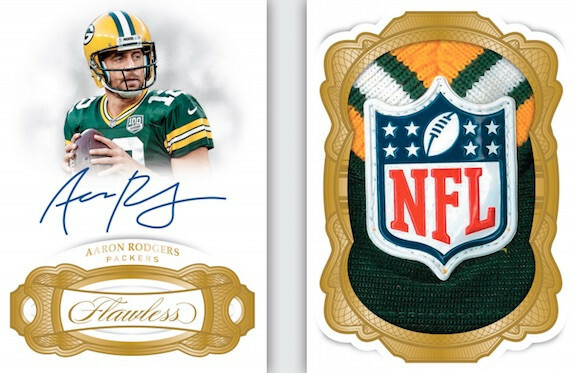 Normally one of the final releases of the NFL hobby season, 2018 Panini Flawless Football features an expected assortment of on-card autographs, quality relics and jewel cards. The 2018 product even promises "more patch autographs and one-of-ones than ever before." All print runs are capped at 25 or less and all signatures are either hard-signed or cuts. As was the case in 2017, each Hobby box should have six autographs, two memorabilia cards and two gem cards. The 2018 Flawless Collegiate edition released much earlier in the season highlighting many of the same football rookies in an NCAA product. Falling two per box, the gem cards come in a few different designs. The 2018 Panini Flawless Football checklist includes a Base Gem set with rookies and additional Sapphire(#/15), Diamond (#/10), Emerald (#/5), Chocolate Diamond (#/4), Canary Yellow Diamond (#/3) and Platinum (1/1) parallels. There are also new gem cards for MVPs, as well as team-based options for the Chicago Bears, Denver Broncos, Kansas City Chiefs, New York Giants and Philadelphia Eagles. If you are searching for the best RPA cards of 2018, the Rookie Patch Autograph subset in 2018 Panini Flawless Football is a top contender. Numbered to 25 copies, the first-year players are also found as Silver (#/20), Ruby (#/15), Sapphire (#/10), Emerald (#/5) and Platinum (1/1) parallels. Switching up the design to incorporate two smaller swatches, the Rookie Dual Patch Autograph line offers similar rarity and parallels as the main RPA set. Those wanting established stars can check out the Patch Autograph cards. These are limited to 25 copies or less, with Silver (#/20 or less), Ruby (#/15 or less), Sapphire (#/10 or less), Emerald (#/5 or less) and Platinum (1/1) parallels. Adding in more on-card autographs, Career Progressions showcases multiple points from the same player's career, and Star Swatch Signatures draws attention to the premium relic in the dead center of the card. Parallels for both sets match the Patch Autograph lineup. Other signed inserts include Captain, Flawless Draft Gems, Laundry Tag Signatures,Signature Gems and Super Bowl MVPs. Expanding the focus, book cards are a new addition to 2018 Panini Flawless Football. The signed Veteran Shield Booklet and Rookie Shield Booklet cards are both limited to 10 copies or less. Another choice comes via the one-of-one Super Bowl Gems line. Featuring hard-signed autographs from Tom Brady or Aaron Rodgers, each card revisits a championship win by using a Super Bowl logo filled with diamonds. More booklet sets include Flawless Duals and Signature Gems.